Page from Spencer F. Baird’s Atlas. Smithsonian Institution Archives, Acc. No. 91-069, Spencer Fullerton Baird Index of Correspondence, 1850s-1870s. Image No. SIA2014-01508. The 19th century was a transformative time for the natural sciences. New discoveries didn't just happen in an armchair. Scientists adventured into unfamiliar territory by land and sea on expeditions, and their new findings fed new theories. Groups like the Columbian Institute for the Promotion of Arts and Sciences and the National Academy of Sciences formalized America's place as a world-class contributor and creator of scientific knowledge. But not all parties agreed on how to research and record these new discoveries. Some argued for an academic approach to science, similar to that in Europe, while others strenuously opposed having that rigid structure imposed on their pursuit of knowledge. Either way, it was understood by all that new knowledge required work in both the field and laboratory. With James Smithson's mandate that his bequest be devoted to "the increase and diffusion of knowledge," first Smithsonian Secretary Joseph Henry gathered key individuals right away. Some became staff, affiliates, and even members of the Smithsonian Board of Regents. However, a world-class institution of knowledge had to rely on connections that went far beyond the staff. Assistant Secretary Spencer F. Baird was a prolific correspondent, fostering an international network of people who could help advance the mission of the new Institution. Baird kept track of these individuals according to their geographical locations in his handwritten Index of Correspondence, 1850s–1870s. Some notable contacts included Louis Agassiz, Asa Gray, and Henry David Thoreau. They, in turn, had their own circles of intellectual friends and colleagues, who helped expand our scientific understanding of the world. English naturalist Charles Robert Darwin (1809–1882) corresponded with Smithsonian staff on a number of research matters in the early days of the U.S. National Museum. His theory of evolution had been inspired by the distribution and varieties of the fossils and wildlife he found during a five-year survey expedition aboard the HMS Beagle as it sailed around the world in the early 1830s. Upon the Beagle's return, Darwin continued his geological work, but it would be another twenty years before he was ready to publish On the Origin of Species. It was only after years of field and laboratory work and many discussions with his peers that Charles Darwin published his theory of evolution in 1859. Asa Gray, a professor at Harvard University, supported his friend's theory, while biologist Louis Agassiz opposed the premise that all species of life were descended from common ancestors over time. Both men would provide guidance to the Smithsonian as Regents—Agassiz from 1863 to 1873 and Gray from 1874 to 1888— while the theory of evolution was still hotly debated. 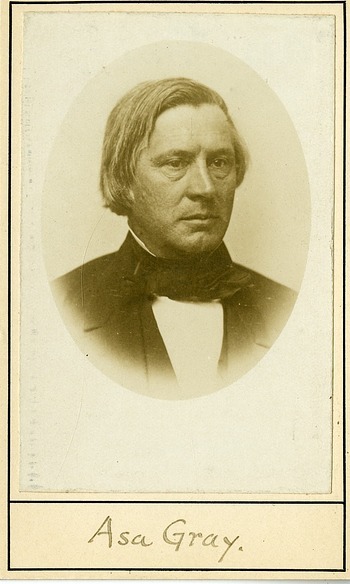 Botanist Asa Gray had been recruited to prepare for the United States Exploring Expedition (1838–1842) and process the over 60,000 specimens which returned. Many in the United States were interested in documenting the Pacific, and in 1828, the United States House of Representatives asked President John Quincy Adams to make arrangements for an exploration. It may have taken ten years and three U.S. presidents to get underway, but the expedition did finally set sail in 1838. 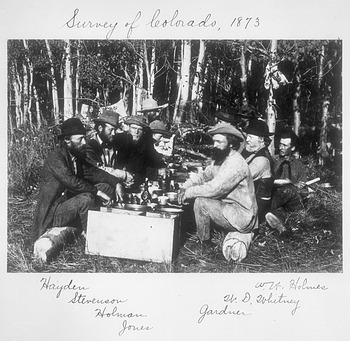 The expedition's speciments became part of the basis of the Smithsonian's collections. Darwin's circle also included geologist Ferdinand Vandeever Hayden, who made the Smithsonian his temporary home between expeditions. His trips to the North American Midwest and Northwest uncovered remarkable findings and brought new territory to the attention of the world. 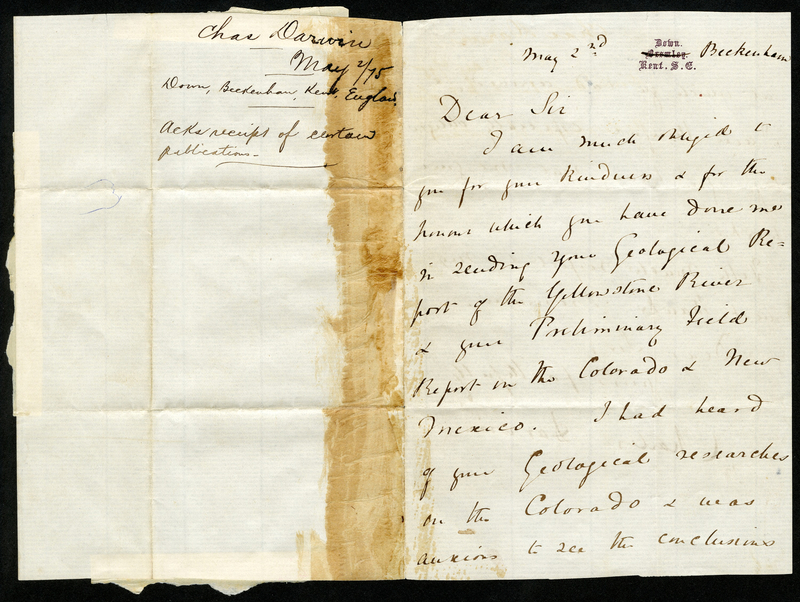 Below is Charles Darwin's letter thanking Hayden for his Geological Report of the Yellowstone River and Preliminary Field Report on the Colorado & New Mexico he had recieved. 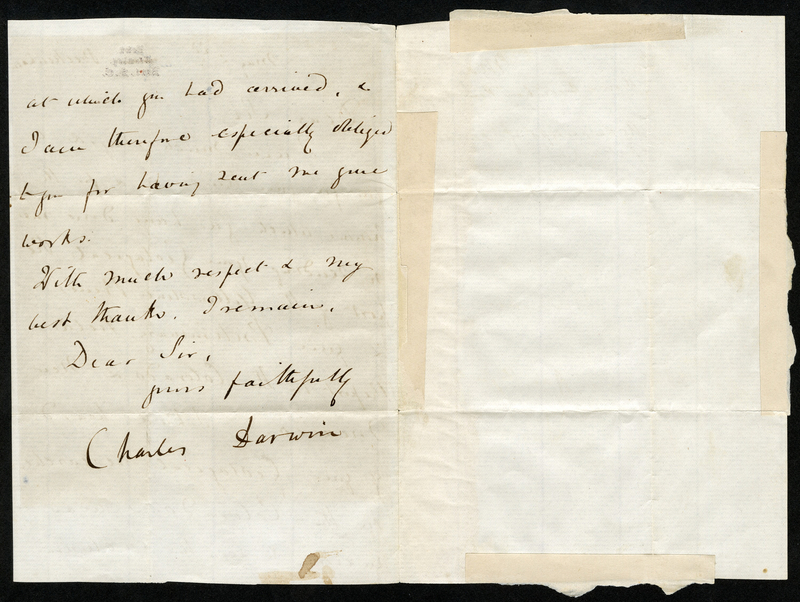 Letter from Charles Darwin. George P. Merrill Collection, circa 1800-1930 and undated. Image No. SIA2016-009764a. Letter from Charles Darwin. George P. Merrill Collection, circa 1800-1930 and undated. Image No. SIA2016-009764b. All hands on deck! It is always time to make new discoveries and share that knowledge with colleagues around the world.